I didn’t mean to read Signs of Life as soon as it arrived, but I had to. It’s a kind of book I love – one woman telling her own story – and her voice was compelling. Rachel had an affair ten years ago, and the consequences were devastating. Her life was still in pieces, and she was sitting in the window of her flat trying to write her story, trying to make sense of what had happened. She wasn’t sure if she could, she wasn’t sure how much she rememembered and how much she had invented, but she had to try. Ten years ago Rachel had a successful career and a stable relationship with her partner, Johnny. But she began an affair with Carl, a collegue who had made less than subtle advances. And then she ended it, with terrible consequences. I couldn’t like Rachel: she drifted through life, not appreciating what she had, never thinking of the consequences of her actions, seemingly oblivious to the feelings of others. But she was real, and I wanted to know what had happenened. The narrative reflected Rachel’s state of mind: it shifted backwards and forwards in time as she recalled incidents and emotions. Sometimes she repeated things, and often she left gaps. She quoted other writings that had made an impression on her. The imagery sometimes felt a little heavy handed, but I think that was Rachel pushing her point. She wondered what she was remembering and what she was inventing, and I wondered of she was just plain unreliable. And yet her story was hypnotic and compelling; she drew me in. In the end I thought I knew what had happened, how rachel had arrived where she was now, but I couldn’t be sure. It is brave to create such an unsympathetic heroine, and clever make her voice so real and to have the telling of her story reflect her so perfectly. 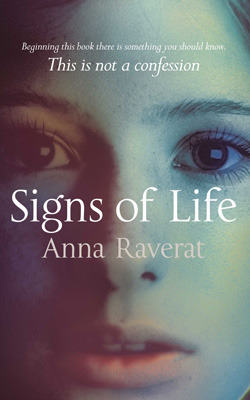 I can’t say I liked it, but I was intrigued by it, and I am very curious to see what Anna Raverat might write next. It is brave for the author to create such an unsympathetic heroine, it makes me want to try this book. I read a book similar to this one where I really didn’t like the main character either because of her behavior and choices. This is one of the ones form the Waterstones 11 that I wasn’t sure about. It’s a case of a book which if it arrives I will give it a whirl, if it doesnt then that is fine too. Do you know what I mean? I think I feel the same as Simon…was the one that least jumped out at me from the Waterstones 11, though I’m aiming to read all of them, this might be at the bottom of the list.